Join Donkey Kong and Diddy Kong as they drum and clap their way through hits old and new in a Game Cube music and rhythm game. One day, DK and Diddy discover a pair of odd barrels on a deserted beach. They learn the barrels are really a legendary musical instrument that plays music not only when you drum on it, but also when you clap. 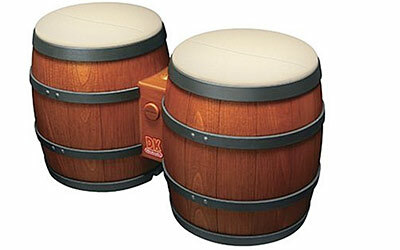 Play along with your favorite tunes using the bongo drum controller. The simple controls incorporate both drumming and clapping for a unique experience that will appeal to gamers of all ages.